As used in this policy, "personal information" means information that would allow a party to identify you such as, for example, your name, address or location, telephone number or email address. Unless restricted or prohibited by law, you should be notified when Scripture Memory Fellowship is required to provide a third party with your personal information. when you join the Scripture Memory Fellowship Website, and when you thereafter create/edit your profile page, identify your content, and/or share your story. E-mails. We use the personal information you provide to us when you send us e-mails or sign up to receive our newsletter or events listing in order to respond to your request — for example, to reply to your e-mail or to send you communications about news and events related to Scripture Memory Fellowship. When you subscribe to the Memorizer, your name and email address is stored at Scripture Memory Fellowship. Your name and email address will typically be visible to other browsers when you comment on products. Donations and purchases. When you donate money to us or purchase merchandise via our store page, your personal information will be handled in one of two ways, depending on which option you choose. If you purchase a memory book or other merchandise from Scripture Memory Fellowship, we will use your personal information for the purpose of sending you the items you purchased. Regardless of the method by which you donate to Scripture Memory Fellowship or purchase a memory book or other merchandise, we additionally use the personal information you provide for the purpose of contacting you about upcoming news and events relevant to Scripture Memory Fellowship. When we contact you for the first time after your donation or purchase, we will use reasonable means to give you the option to choose not to be contacted in this manner again. When you donate money as part of one of SMF’s fundraising campaigns, your name will be published on our “supporters page” unless you request otherwise. Scripture Memory Fellowship Website. When you join our network you provide personal information to create your account and establish a password and profile. We use that personal information to establish and maintain your accounts, provide you with the features we provide for account holders, and for the purpose of contacting you about upcoming news and events relevant to Scripture Memory Fellowship. First, SMF may share personal information with our contractors and service providers in order to maintain, enhance, or add to the functionality of the Website or the Website services. If Scripture Memory Fellowship is required to provide a third party with your personal information (whether by subpoena or otherwise), then SMF will use reasonable means to notify you promptly of that event, unless prohibited by law or SMF is otherwise advised not to notify you on the advice of legal counsel. Scripture Memory Fellowship has implemented reasonable measures to protect against unauthorized access to and unlawful interception or processing of personal information that Scripture Memory Fellowship stores and controls. However, no website can fully eliminate security risks. Third parties may circumvent our security measures to unlawfully intercept or access transmissions or private communications. We will post a reasonably prominent notice to the Websites if any such security breach occurs. 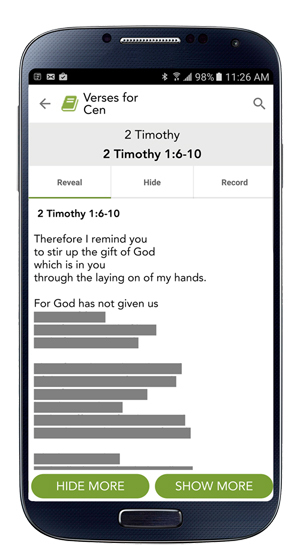 Our Data Usage Policy covers how we maintain and use information about you that is collected by our Websites and server logs, including when you log into a website using your ScriptureMemoryFellowship.org Account. Non Personal Information We Collect. When you use the Websites, our servers (which may be hosted by a third party service provider) may collect information indirectly and automatically (through, for example, the use of your “IP address”) about your activities while visiting the Websites and information about the browser you are using. In addition, whenever you use your ScriptureMemoryFellowship.org Account to log into a website, our servers (which, again, may be hosted by a third party service provider) keep a log of the websites you visit and when you visit them. No Linking. We do not intentionally link browsing information or information from our server logs to the personal information you submit to us. We use this information for internal purposes only, such as to help understand how the Websites are being used, to improve our Websites and the features we provide, and for systems administration purposes. SMF may use a third party analytics provider to help us collect and analyze non personal information through operation of our Websites for those same purposes; however, we will never use a third party analytics provider to collect or analyze any information through our operations as a service provider. No Access. As a Website Account service provider, SMF could technically access your web-based account tied to our Website service, and could log in on behalf of any of its users to any of the accounts they have accessed using their Account. Scripture Memory Fellowship will never use this technical login ability for any purpose unless otherwise required by law. Notice. If Scripture Memory Fellowship is required to provide a third party with your non personal information or to log in on behalf of an Account user (whether by subpoena or otherwise), then SMF will use reasonable means to notify you promptly of that event, unless SMF is prohibited by law from doing so or is otherwise advised not to notify you on the advice of legal counsel. Consistent with the federal Children’s Online Privacy Protection Act of 1998 (COPPA), we will never knowingly request personal information from anyone under the age of 13 without requiring parental consent. Any person who provides their personal information to SMF through the Websites represents that they are 13 years of age or older.